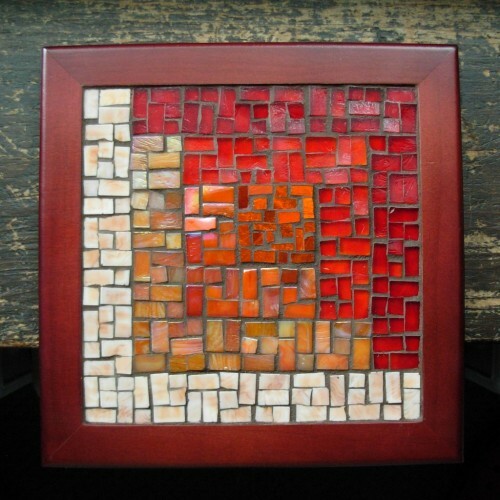 Asymmetric Log Cabin Trivet in Red and Orange by Margaret Almon, glass on wood, 8×8 inches, $76. SOLD. 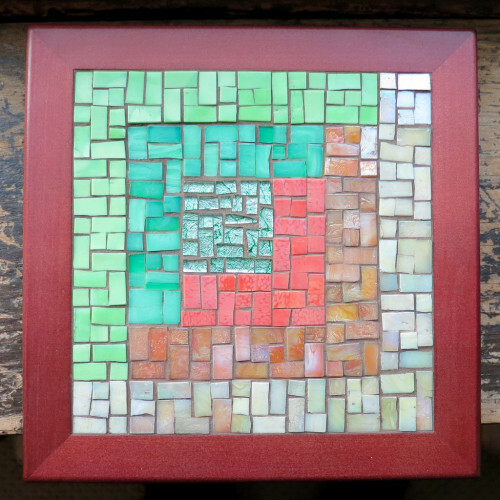 Asymmetric Log Cabin Trivet in Moss, Coral and Sand by Margaret Almon. Glass on wood, 8 inches, $76. SOLD. 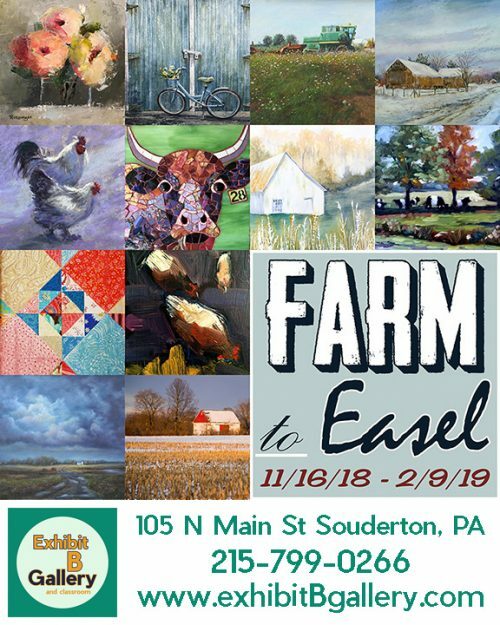 One of the most rewarding aspects of creating art is having it become part of a family’s traditions. In November, Nutmeg Designs received a message requesting a thoughtful commission. 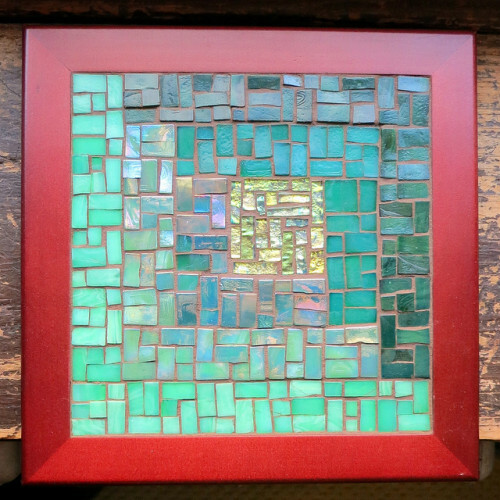 . . .I am writing to you because the gifting of your beautiful your Mosaic Trivets have become a sweet and meaningful tradition in our family! 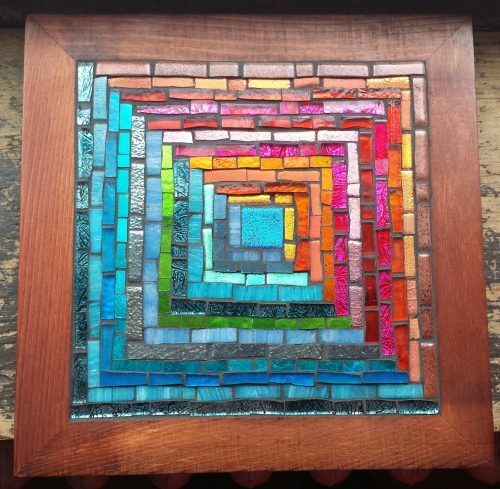 My sister Lauren found your site, and commissioned a Log Cabin Mosaic Trivet for my wedding in our wedding colors, and just a few months ago did the same for my brother when he got married! 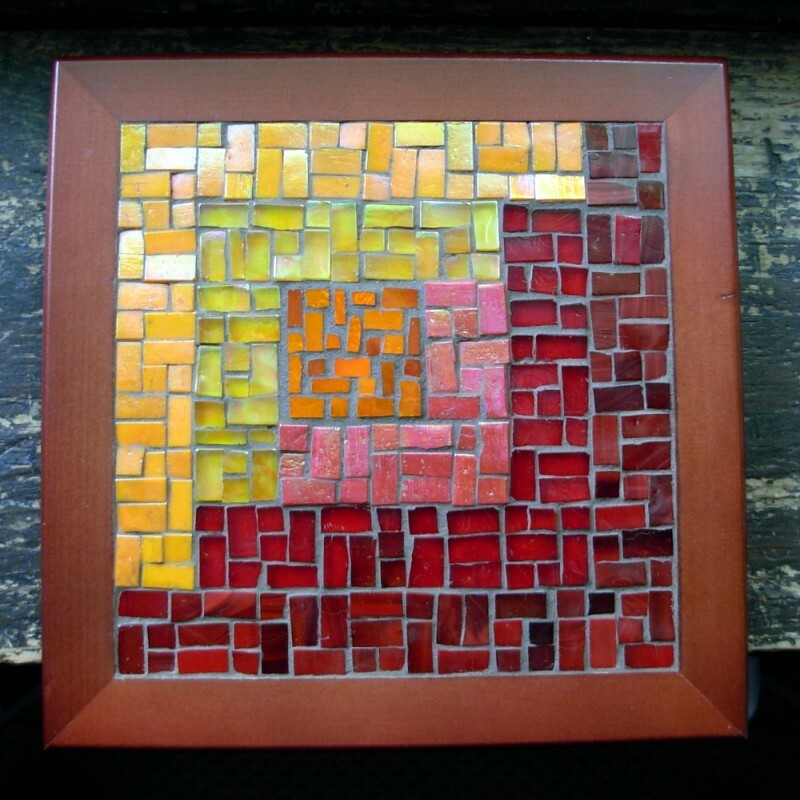 So now she and her husband are the only ones without a trivet of their own, and I would love to gift them with one of your trivets for Christmas if that is possible. . . The brother requested his sister’s wedding colors and sent photos of the shades of moss green, coral orange and sand. It was a delight to bring it full circle to Lauren, who ordered the first two trivets. The first is below, in oranges and reds. 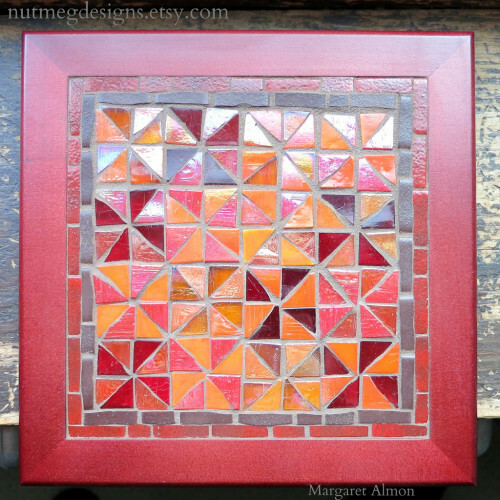 Asymmetric Log Cabin Trivet in Orange and Red by Margaret Almon. Glass on wood, 8 inches, $76. SOLD. The second was in deep lovely blues and eggplant purple. You can commission your special gift here. 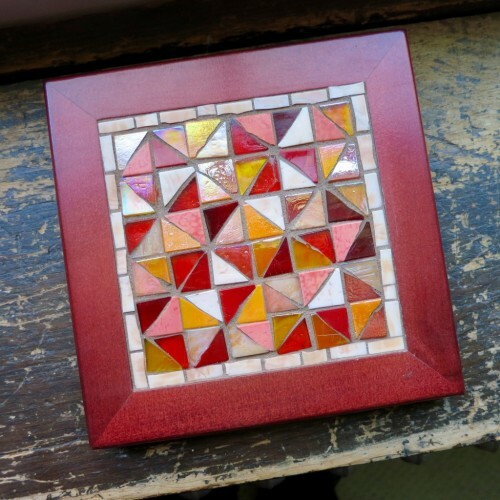 Broken Dishes Quilt Block Trivet by Margaret Almon, glass on wood, 6×6 inches, $57. No dishes were harmed in the making of this quilt block trivet. Broken Dishes is one of my favorite quilt patterns, and I enjoy the fact that I use only glass tile in creating the design in mosaic. There is a form of mosaic, Pique Assiette, that is made entirely from broken dishes. Glass is my love. The creative spirit incarnates in many different forms and mediums, and for a long time I thought I loved sewing, when in fact what I loved was fabric and pattern. 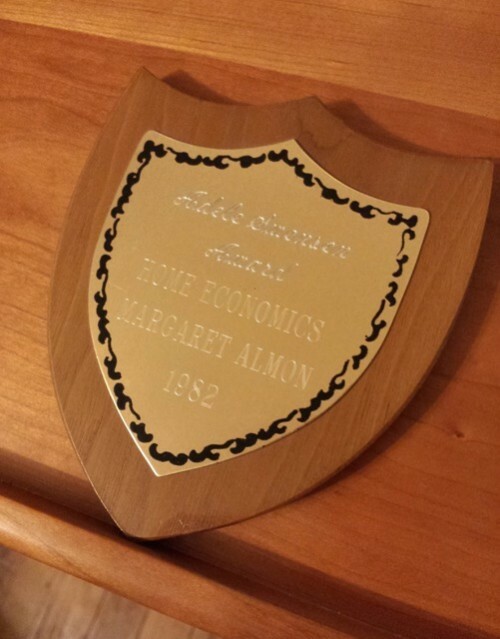 Adele Swensen Award for Excellence in Home Economics, 1982. I was the girl who had a talent for reading pattern instructions. I would read anything. Reading was my drug for the pain of junior high, and this compulsion came in handy in Home Ec. Most of the other girls didn’t read the instruction sheet, or didn’t understand it, and would ask the teacher what to do next. This puzzled me; asking a question was not something I ever considered. This is the irony that I became a Reference Librarian, without ever having asked a Librarian a question. I expected myself to know before knowing, to know everything in advance. In Home Ec, the feeling of power that came from comprehending the instructions and answering other girls’ questions inspired me to tell my parents I wanted to become a Home Economics teacher. This was definitely “not to my potential.” Yes, one could major in Home Ec at the University, but there was an unspoken belief that cooking and sewing were not truly academic subjects, but women’s work. The confounding factor was that sewing made me cry. All manner of emotional pain could not bring the tears, but a crooked seam, or a ratty looking bobbin thread could bring me to sobs. I loved the big pattern books on the tilted tables. I loved fabric, the texture and colors. I loved that weaves had names like herringbone, and that they were identifiable. I loved notions like zippers and buttons and thread. I loved the smell of sewing machine oil and the line drawings on newsprint illustrating each step of construction. But actual sewing tested my limits: I wanted it exactly right. I saw flaws that no one else did, which made me well acquainted with my seam ripper(which in spite of its association with imperfection, was still a lovely notion). I felt I should want to to sew, that the Adele Swensen award meant something about my destiny. As an adult, I went through a time of wanting to make quilts, circling back to the sewing machine that tormented me. I finally had the revelation that I did not like sewing. I loved quilts, but to actually make one, no. Instead my husband decided he wanted to continue his grandmother’s legacy and learn to quilt and I gave him my sewing machine. His keen spatial abilities allowed him to align seams with precision. That year I made Christmas cards in a log cabin quilt design with magazine papers in red and green, and it was a delight. 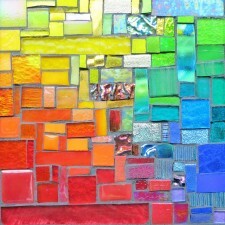 And then when I started making mosaics, I made quilt designs in glass, and this was even more delightful! This is what happens when you discover your medium. Not that I don’t ever get frustrated, but the joy outweighs it. The impulse to make something beautiful can be incarnated in many forms. *Women’s work* has what beauty has arisen from it, needlework, sewing, quilting. A quilt is often the only legacy from women in our family histories,their biography in cloth, and I hope to write mine in glass. Green Lightning by Kay Bachkai. 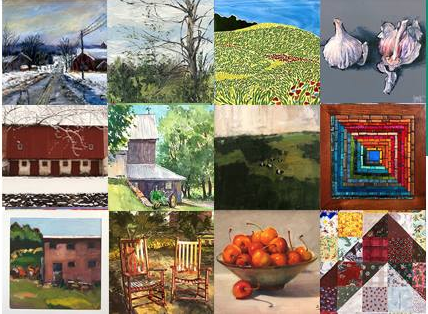 Keystone Quilters Guild 2015 Show. Photo by Wayne Stratz. 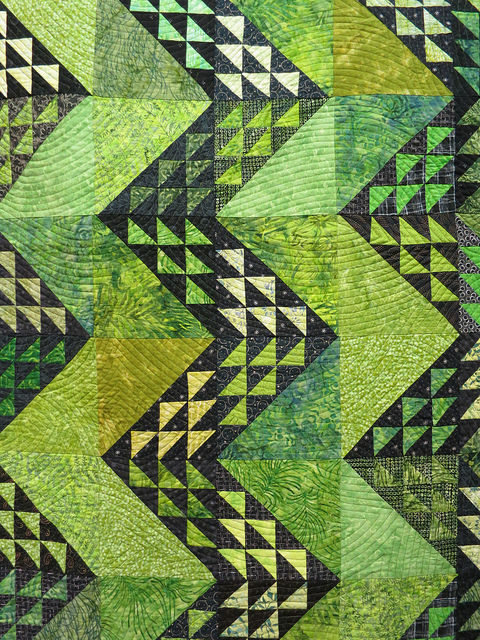 Quilt Block Trivets by Margaret Almon. Broken Dishes pattern, made from glass tile, 6×6 inches, $57, left and right SOLD. 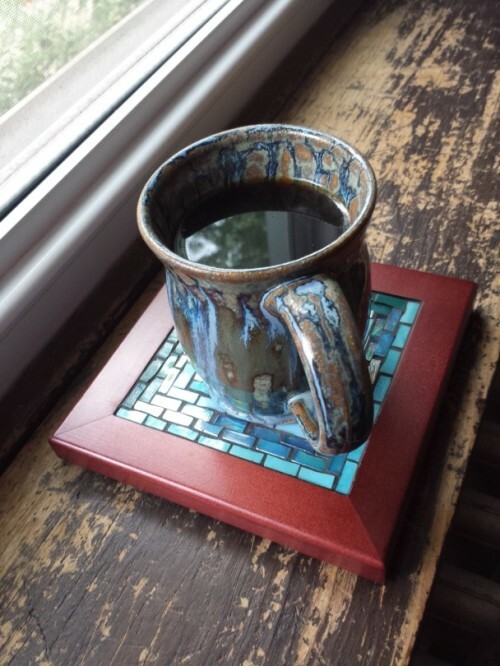 Peaceful Pleasant Springs Pottery Mug of Coffee with Blue Green Mug Mat by Margaret Almon, $57 NFS. 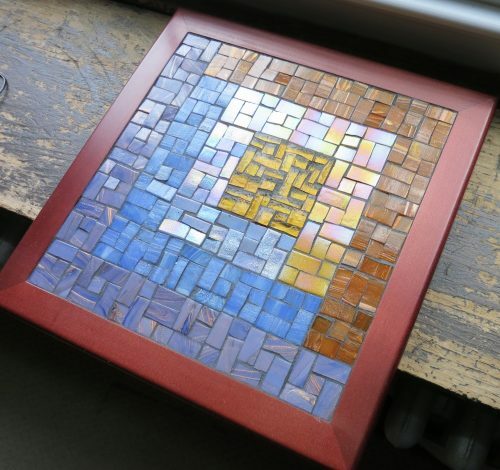 Asymmetric Log Cabin Mosaic by Margaret Almon. 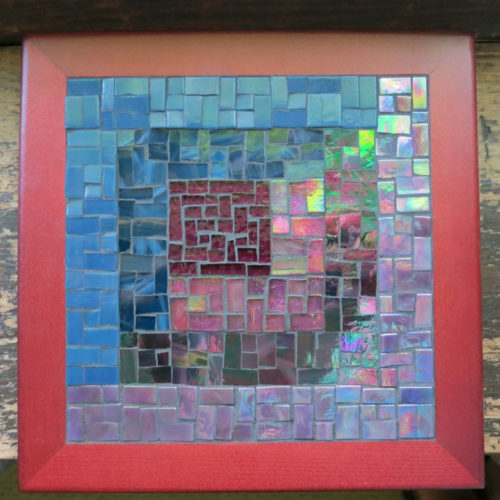 Glass on wood, 8×8 inches. More trivet love at Nutmeg Designs Etsy.